This post is the second of a two-part series about the barbecue my new wife and I ate on our honeymoon. For more explanation and more porky pix, see part 1: “The West”. We’d just finished a stint in Eastern Tennessee, where we’d enjoyed some bodacious relaxation but no phenomenal barbecue. We knew we’d have to make up for it on this comparatively short stay in the Carolinas. 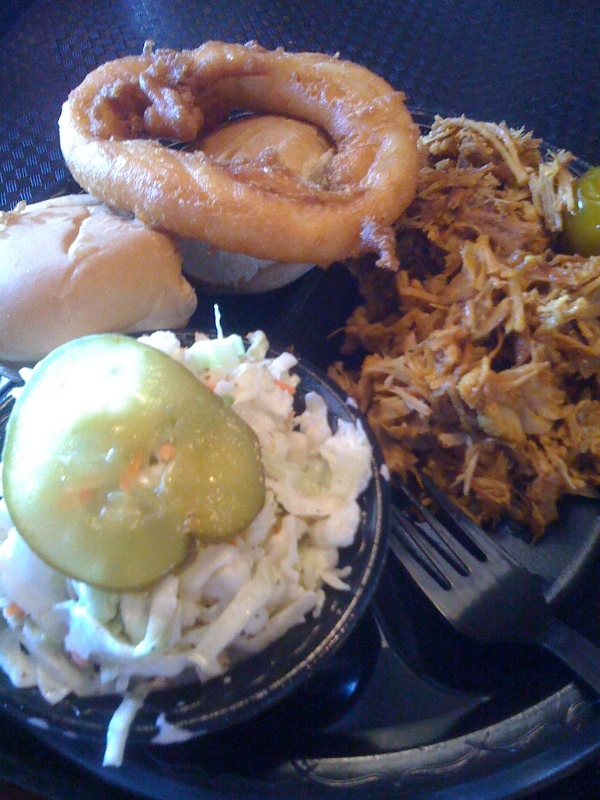 Our first stop en route to Charleston was chosen largely for convenience’s sake: it was not too far off our course, and we’d be passing by around lunchtime (unlike some of the more well known SC barbecue joints), and they’d be open on a Monday afternoon (again, unlike some of the more traditional joints, which are often open Thurs-Sat only). With these conditions in mind, a bit of internetting led us to Hudson’s Smokehouse, which had gotten favorable reviews on the sites I’d checked. They had a lunch buffet that looked pretty good, but the idea all-you-can-eat fullness in the 100-degree heat followed by a few hours in the car didn’t strike us as the wisest dining decision. So we ordered off the menu: we each got the pork platter, and I got green beans and baked beans while Rebecca got sweet potato fries and collards. Charleston was blazing hot. Heat indices into the 110s. This is ideal weather for barbecue. Indeed, any weather is ideal weather for barbecue. We were in South Carolina, and we wanted some of the local stuff. At Hudson’s the day before, the barbecue was Lexingtonesque, by which I mean that it was pork shoulder, served with a vinegar sauce that had just a bit of ketchup in it for color and sweetness. That’s how they do it in the western part of NC, centered around Lexington. 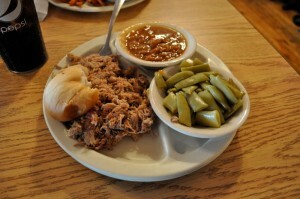 When you talk about South Carolina barbecue, though, the mind usually goes to mustard sauce instead of ketchup. Charleston, from what I understand, is known for having a variety of native barbecue styles, but since we were in SC we wanted mustard, and my research told me to get it at Bessinger’s. I got the pork plate, with baked beans and cole slaw. Bessinger’s is notable for throwing in an enormous onion ring with every meal as well. Let me tell you something about that onion ring: It was something else. Enormous and battered beyond recognition, it was hard to tell, even when looking closely, where the batter ended and the onion itself began. You know that problem you sometimes have where the onion and batter don’t stick to each other, and you end up pulling the whole (scorching hot) onion out on your first bite? At Bessinger’s, the onion and batter had truly become One. Was it the best onion ring I ever had? No. But I have to give them some real points for technique. The barbecue was a bit disappointing. By itself, it had just a trace of smoky flavor, and not much of the salty fatness that would have to be present to make up for the relative lack of smoke. The mustard sauce on the table was too sweet for my liking, with none of the vinegary kick that, frankly, I expect even out of a bottle of Plochman’s. The cole slaw was a generic, mayonaissey, Midwestern affair. The beans were on the sweet side for my taste, but otherwise pretty well executed. Maybe I was coming off of a high from the day before and expecting too much, but with the exception of that exceptional onion ring, I walked away a bit disappointed. For reasons related to heat and pork fatigue and the otherwise awesome food in Charleston, this was the last barbecue meal we had in South Carolina. Unless you are on the way to the bustling burgs of Hookerton or Vanceboro, Ayden is not on the way to anything. After getting off of I-40 North 45 minutes north of Wilmington, we spent about an hour meandering the highways of the beautiful North Carolina countryside before we started seeing signs for the small town. And when I did see those signs, I felt the kind of excitement that an adult man, having outgrown birthdays and Easter baskets, doesn’t get to feel very often. For the second time in as many years, I was headed to the Skylight Inn. My first time at the Skylight was a very special day. We were near the beginning of our barbecue trip, and already I think we were doubting the wisdom of eating So Much Pork. 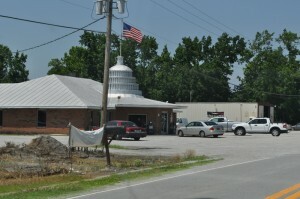 We drove a long way for what we had described as the best barbecue there is, and we were a bit perplexed to find a shack with a faux rotunda and a huge billboard bragging about how Ayden was the barbecue capital of the world. The menu is three lines long: 1) Sandwich. 2) Platter (small, medium, large). 3) By the pound. 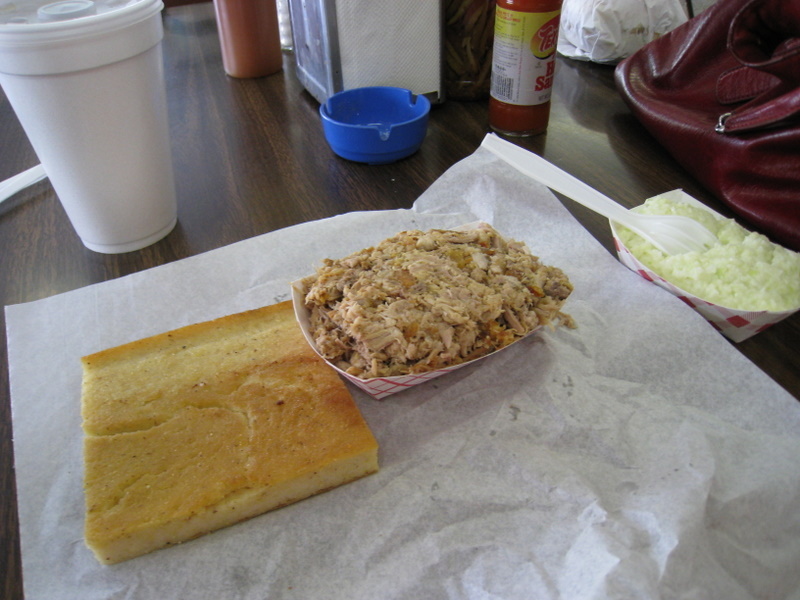 The platter was a paper tray heaped with chopped pork and a bit of uninspiring slaw, and laid over the top was a slab of what I would describe as corn brick. That first bite might have been the most delicious thing I ever tasted, either before or since. Fatty, smoky, and strewn with crispy little bits of skin – the cracklins. It was so good, I washed it down with a sandwich. My return to the Skylight thus had a lot to live up to. And, as such things often turn out, it didn’t live up. Don’t get me wrong, the pork was good, but I think that our 3pm arrival meant that we got stuff that’d been sitting under the heat lamp a bit too long. Also, they’d gone a bit light on the salt. By the end of my sandwich this time around, I had figured out the amount of vinegar and salt that needed to be added to each bite to make it great. And then: I tasted a piece of the pound I’d gotten to go, to bring back to my brother in Brooklyn. It was better, like it’d been picked from a non-dried-out part of the pork pile. Looking back now, I really want to go back to Skylight. Like, right this instant. Bum’s, like Skylight Inn, has no website. That’s the first good sign. After leaving the Skylight, we headed downtown (about eight blocks) to Bum’s, a joint we’d missed on our previous pass through Ayden. It was awesome. Unlike the Skylight, there were multiple steam tables of various down-home sides. We got a couple of barbecue sandwiches, along with some butter beans, collards, and beef stew to share. Everything was excellent. The pork was arguably, on that day, better than Skylight’s, and was even better when topped with the stagnant-water-colored sauce kept in a repurposed glass ketchup bottle on our table. I remember that the collards in particular were outstanding, with a great balance of vinegar tang, smoked porkiness, and bitter greeniness. Bum’s was a great way to wrap up the barbecue-fueled portion of our honeymoon adventure. Now I’m just looking for another excuse to get myself to the Carolinas. Or, at least, to find some decent pork here in NYC. Date: June 25, 2010 · Author: Boone Gorges. Some friends of mine (Joe Ugoretz and Jim Groom) were chatting on Twitter yesterday about how Userthemes, the WPMU/MS plugin they rely on to allow user customizations of copied system themes, had broken with WordPress 3.0. I decided to take a look at it. After digging a little, I found the immediate cause, as well as a workaround. Please note that this workaround is very much a hack. It shouldn’t cause any security issues (see explanation below), but it will break the next time you upgrade WP. Joe’s problem was that the plugin was only working for Super Admins. Administrators of single Sites could not copy new Userthemes, and they were redirected to the dreaded wp-admin/?c=1 when they tried to access the Edit Userthemes panel on the Dashboard. I figured it was a problem with permissions, and it was: all of those functions are triggered only for those users with the capability edit_themes, but for some reason only Super Admins, and not Administrators, were showing up as having that ability. (The weird thing – when I did a var_dump of WP Roles, I saw that Administrator *did* have edit_themes.) Maybe there’s some setting in WPMS that allows users to edit themes, but I couldn’t see it. So the solution is to change the edit_themes check to something else. switch_themes seemed like an obvious choice to me, since anyone with the ability to switch themes on a given blog would also have had the ability to edit themes on that same blog. So there shouldn’t be a security problem – only blog admins should have the ability to make userthemes. You’ll need to modify the plugin, as well as a few lines in the WordPress core. Back up. I’m not responsible for anything that goes wrong! Open the userthemes.php file. (I’d link to it, but I can’t find it anywhere on the web. When I’m at a better internet connection, maybe I’ll upload a version for you to edit. Maybe someone out there has a copy to share.) Search for all instances of ‘edit_themes’ and replace with ‘switch_themes’. From your WP root directory, open wp-admin/theme-editor.php. On line 12, change ‘edit_themes’ to ‘switch_themes’. From your WP root directory, open wp-admin/menu.php. On line 173, change ‘edit_themes’ to ‘switch_themes’. This should restore the basic functionality of Userthemes (though Joe says that there’s still some bugginess – if you can’t access the Edit Userthemes from the main Dashboard page, try going to the Userthemes panel first). I must repeat that this is an ugly hack, and I’m hoping that someone smarter than me will step in and tell me why this is happening in the first place. Date: June 23, 2010 · Author: Boone Gorges. Afterwards I went on a honeymoon with my lovely bride through the southeastern US. Unlike a North Carolina vacation we took a few years ago, the focus of this trip was not barbecue. 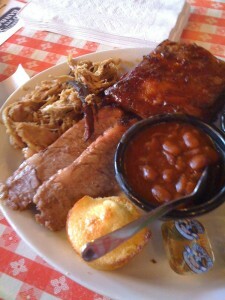 That said, we still had quite a few good barbecue meals. (I mean, it’d be a downright sin to go through North Carolina without stopping at some of the shacks.) Without any further ado, then, here is a retrospective of my wedding and honeymoon through the lens of smoked meats. 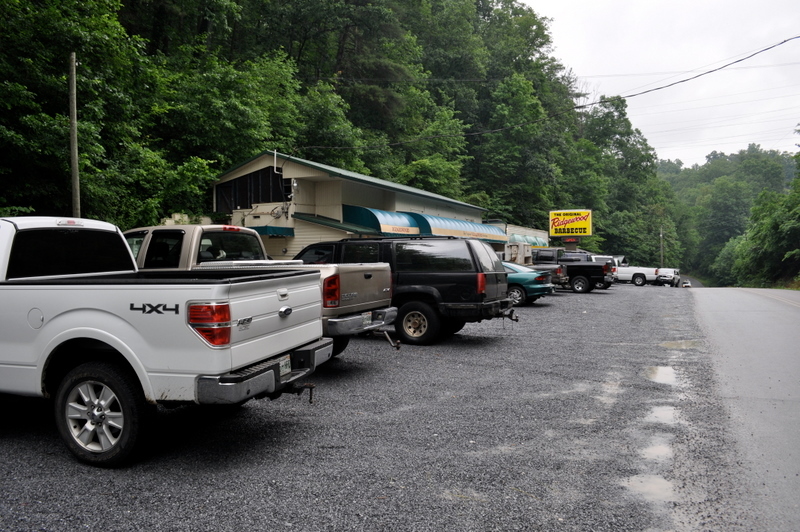 Part 1, appearing here, deals with what I’ll call “the West” – or more specifically, barbecue in the style of the west-of-the-Appalachians, which dominated the first part of our trip. Part 2, “the East”, will come later in the week. The menu was ribs, pulled pork and chicken for the meats. 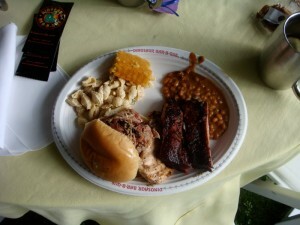 For sides, we had baked beans, cole slaw, and macaroni salad. Unfortunately, I don’t have a lot of great pictures of the food – everyone seemed to be too anxious to eat it to be able to take good pictures, and I haven’t gotten the files from the photographer yet – but here are a few pictures I could scrounge up. My own take on Dinosaur, and this meal in particular, is that their ribs (the meaty St Louis cut) are really top-notch, the best I’ve had here in NYS. The sauce is a traditional KC-style tomato sauce. Dinosaur also provided a spicier sauce with a bit of mustardiness that went well with their unsauced pulled pork. I’ll leave it to some of my gentle readers who were in attendance to give more feedback on the quality of the food. IMO it was pretty effin good for wedding grub. We spent a few days in Washington, DC near the beginning of the honeymoon, and from there we traveled to eastern Tennessee and the foothills of the Smoky Mountains. Knowing we’d be traversing the whole diagonal of Virginia, I pinged my SW VA pal Jeremy for a recommendation. Before he had the time to respond, my research had led to the same recommendation that he ended up delivering: Ridgewood Barbecue, just inside of Tennessee. 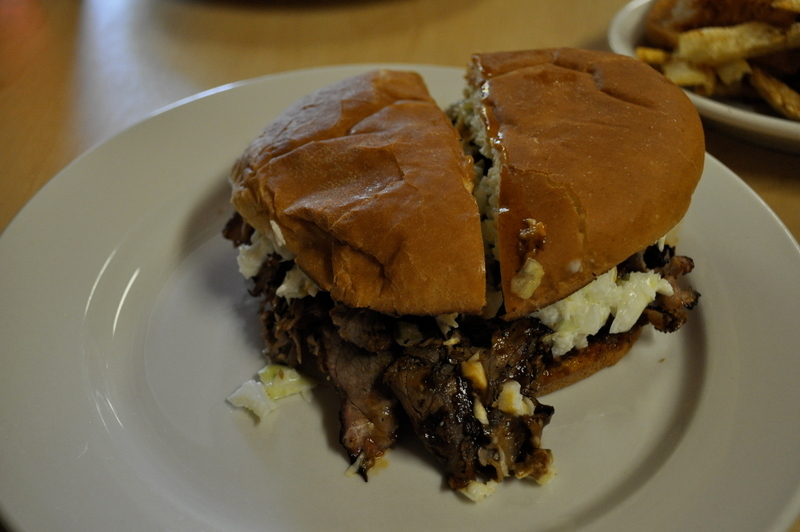 We knew we had entered the South when a fellow in the parking lot gave us the unsolicited advice to try the beef, even if we normally preferred pork barbecue. This is an appropriate place for me to step back and make some commentary on barbecue snobbishness. I grew up in northeastern Wisconsin, an area that might excel in venison summer sausage and fried cheese curds but has little in the way of local barbecue. As a result, I haven’t been raised with any deep prejudices about the nature of barbecue: that it must be pork, that it must be smoked over hickory, that it must not have tomato in the sauce, what have you. While I can’t out-and-out claim that I’m glad I grew up not eating barbecue, I can say that a pleasant side effect of my barbecueless youth is that I’m willing to take it on its own terms. (As an aside, I think I enjoy a similar position with respect to pizza, though living in Brooklyn for the better part of a decade has probably warped me a bit.) This is in stark contrast to other barbecue fanatics whose rantings I have so often come across on the web, whose hearts and hatches are closed to a large portion of the wonders that the world of smoked meats has to offer. I feel sad for them. 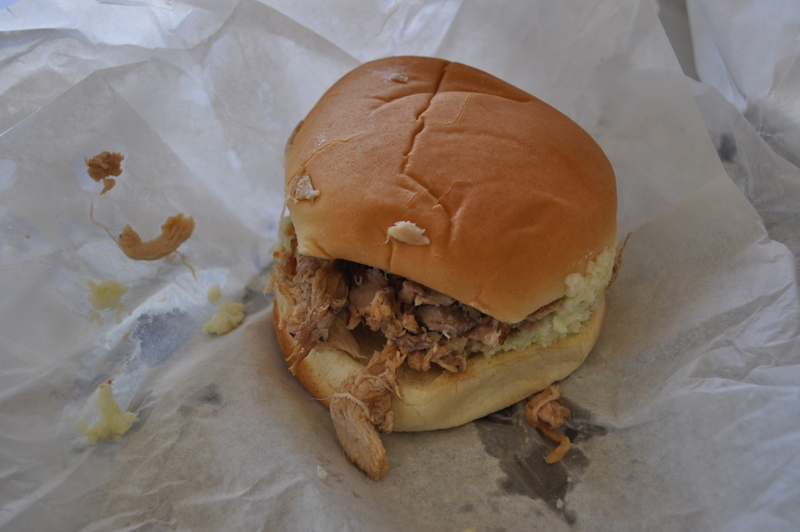 And I feel glad that I was able to take the gentleman’s advice seriously, and order both beef and pork barbecue sandwiches at the Ridgewood. That’s because, while the pork (unusual in that it’s sliced ham, rather than chopped or pulled shoulder) was really delicious, it was a bit overwhelmed by the amount and the character of the sauce on the sandwich. The sauce is a weird mix of a couple of different styles: far more tomatoey body and sweetness than a Carolina sauce, far more vinegary tang than a Western sauce. Really good, but too much for the relatively delicate pork. (Order it on the side, if you can.) The beef, however, was really something to behold. A huge beefiness and a punch of smoke flavor punched through the sauce. It was awesome. And the sides were pretty great too, especially the baked beans: with more onion and peppers than you expect in barbecue beans, these were possibly the best baked beans I ever had. Perfect balance of sweetness and spice. Worth the trip in themselves, really. 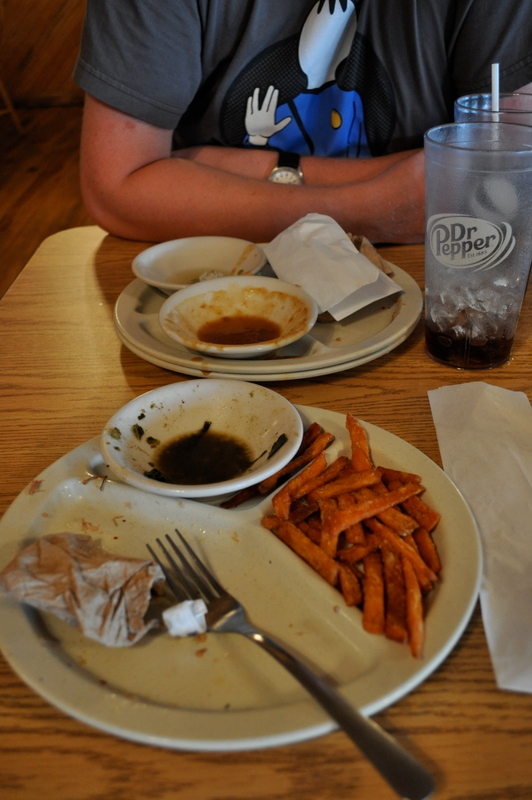 The second clue that we were really in the South was when the waitress, without asking, brought enormous styrofoam cups of soda to the table as we were finishing our food – “refills to go”, she said. Wowza. As I said above, the honeymoon was not intended to focus on barbecue. If it had been, we wouldn’t have travelled to eastern TN, which is not to the best of my knowledge particularly well known for its barbecue. That said, we did drive past a number of places bragging about their ribs (pandering to northern tourists, maybe? ), so we decided to succumb. A bit of research showed that Bennett’s was perhaps the most reliable in the area. The brisket was disappointing, especially coming from the incredible beef experience we’d had the previous day at the Ridgewood. The fat was gristly, the meat was underseasoned, and there wasn’t much in the way of smoke flavor. 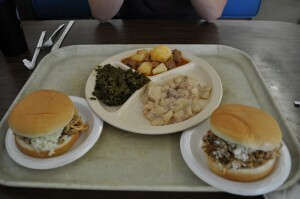 As for sides: as at the Ridgewood, the standout was the dish of baked beans. The beans were very straightforward and traditional, but really nicely executed, with a bit of smoke, a bit of sweet, and beans that didn’t have the texture cooked out of them. It’d be a few more days before we traversed the Great Smokies and managed another barbecue meal. But that’s a subject for another post. Date: June 20, 2010 · Author: Boone Gorges.